Dianne Athey is one of London Terrace’s many multi-faceted artists. She’s a painter, who’s recent works include a series of realistic, large, Sea Glass paintings. She also paints people and recently finished portraits of a Comic Con Cosplayer and friend who has a “Shoe Obsession”. Her inspirations come from many different sources! As a Life Member of The Art Students League, Dianne has proudly exhibited at the venerable institutions of The National Arts Club, The Salmagundi Club, and The Pen and Brush Club to name a few. Just two blocks from London Terrace Dianne spends much of her time at her painting studio in the West Chelsea Arts building. Twice a year she participates in the Highline Open Studios, giving the public a look at her working space. As a veteran of the arts community in Chelsea, she is delighted that there are now over 300 galleries making their home in the neighborhood. Dianne is also a musician who played bass with the bands ‘Nervus Rex” and “The Riddles” in the 80’s and 90’s respectively. She grew up in Akron, Ohio, getting an early start playing guitar and singing with her friend, Chrissie Hynde who went on to create the band,The Pretenders. Her parents started her out learning classical piano, a skill she is thankful to have to this day, but her real musical passion is more driven by rhythm. 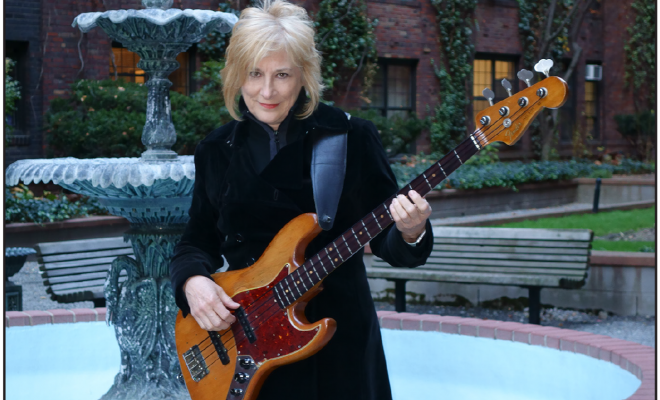 She recalls the first time she went into a music store and picked up a bass guitar. The epiphany she felt that day, “this is my instrument” has stuck with her to this day. During the New Wave music era she joined her first band, “The Nervous Wrecks”. You didn’t need any kind of reputation she said, you could just jump into a group and jam. Dianne is still jamming around the city, currently playing in two bands: “Broad Band” and “FolkSoul”. Additionally, Dianne is a working graphic designer in the design partnership: A+G Design. Yes, she’s a busy woman but you can catch up with her to hear stories of the neighborhood. Regarding our building, she says, “There’s a six degrees of separation at London Terrace, everyone knows someone who’s lived here”.